I combined 2 great challenges on todays card. 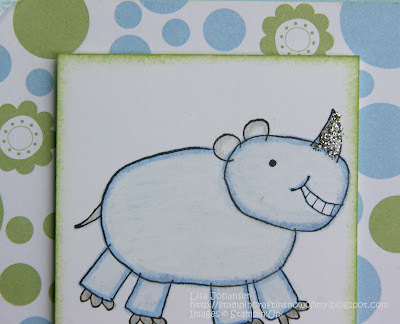 The first is this weeks challenge from the Friday Mashup blog and we are supposed to create a card using "zoo animals". I went through my stash, trying to find something that would work, and I came across the set 'Zoofari'. 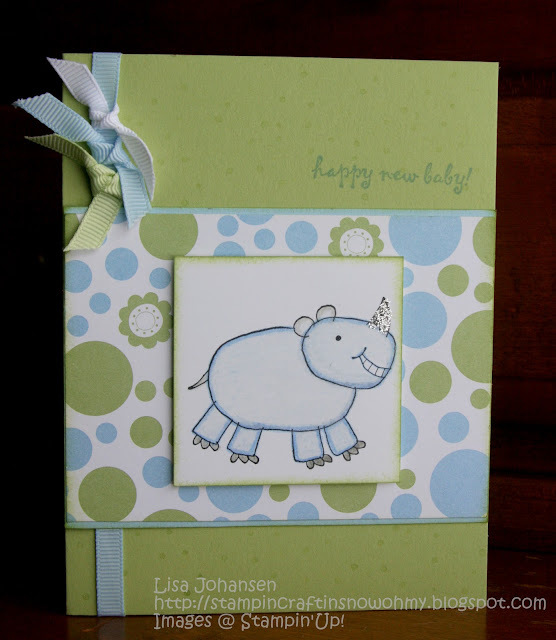 My daughter has a friend that is expecting a little boy and her baby shower is coming up, so I thought the little rhino would make a cute image for a baby card. I added some silver Stickles to the horn to give it a little pop, and the square the rhino is stamped on is popped up with dimensionals. When my daughter got home I showed her the card and she told me her friends theme for the baby is jungle animals so it worked out perfectly! 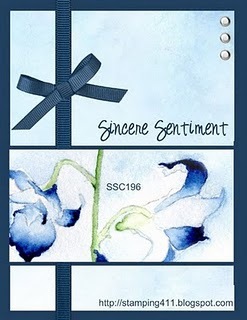 The sketch is this weeks challenge over at the Stamping 411:Saturday Sketch Challenge. Love this clean and simple sketch! Fun baby card! Love that stamp set! Thanks for playing along with Stamping 411. Totally adorable especially the sparkly horn! 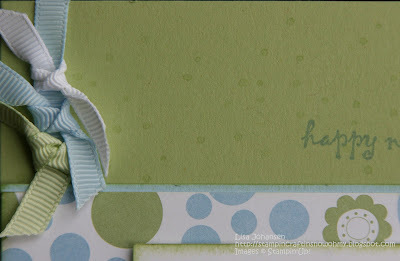 Cute baby card - especially with the glittery horn. Thanks for playing with our Friday Mashup!. Very Ca-ute! I love the colors and the ribbon ties. Just perfect. TFS! Sweet card, and the sparkly horn puts it right over the top for me, awesome! I totally love it! Great job with both the challenges! I love that horn...and the way you colored it! Super cute.. Thanks for playing along with us at The Mashup! You picked one of my all time favorite animal sets!! 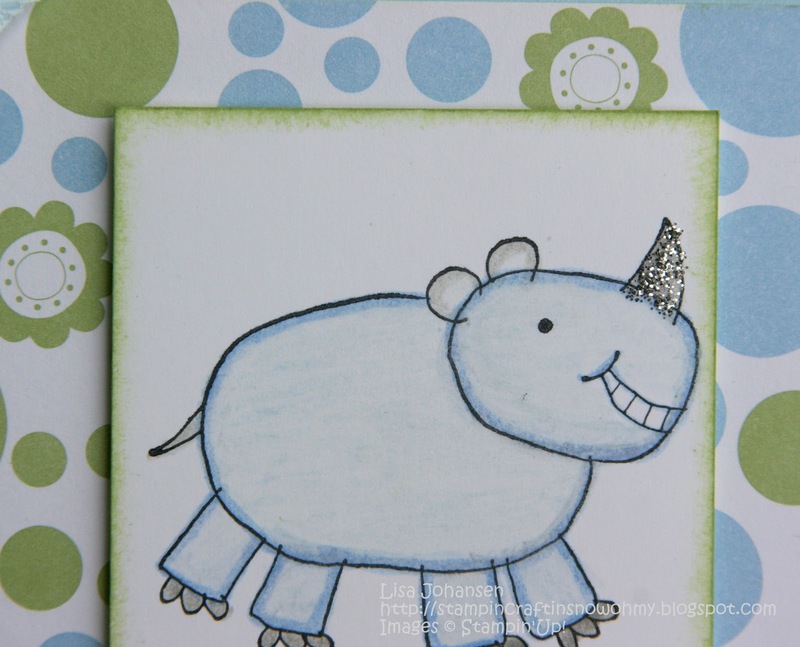 I love that Rhino, and I love the silver glitter on the horn what a cute idea. Thank you so much for joining us at friday mashup and a Super Thank you for using the Banner on your blog! !